ClearOS Community 6.5.0 Beta 3 has arrived! Along with the usual round of bug fixes and enhancements, version 6.5.0 introduces Marketplace enhancements, a Network Detail Report, an Administrators app,Official Amazon EC2 Support, a Software RAID Manager, Mail Archive,UPnP Support, an updated Web Server app, as well as new reporting features. Some of the new apps in the beta are NOT available via the Marketplace but can be installed via yum. You can find installation and app details further below. The following is a list of features coming in ClearOS Community 6.5.0. Under the hood, some changes were made to support OwnCloud as well as web-based applications (Tiki Wiki, WordPress, Joomla, etc.). We are hoping to include a free version of the Network Map app available for the final release. Virtual Machine and Cloud Images are not available for this release. 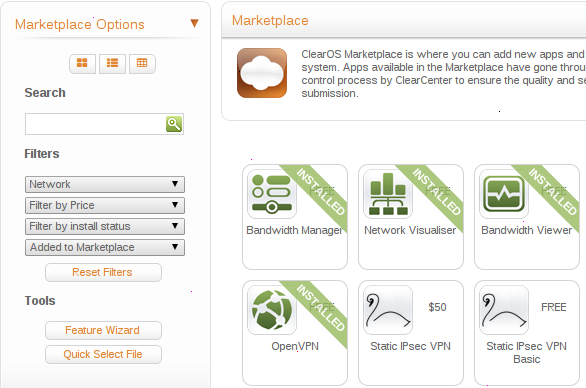 For new users, there's a Feature Wizard that steps through various features in ClearOS. For veteran users, the Category Wizard displays apps by category (Server, Network, System and Reports) for quickly selecting what's needed. For MSPs and consultants, the Quick Select option provides one-step recipes for deploying customer solutions. In addition, there's a new Layout Manager that lets you choose how you want to view Marketplace apps (see screenshot below). We are still working through some usability issues in the entire install wizard, so feedback is certainly welcome.